Prekių katalogas - Sound Service — autоmobilių ir namų garso aparatūra, vaizdo ir garso įranga. Designed to match the look of 55" and larger TVs, the YAS-152 features dual built-in subwoofers for rich bass, a single-cable connection to your TV and Bluetooth® that lets you wirelessly stream music from your iPhone®, iPad® and Android™ devices. 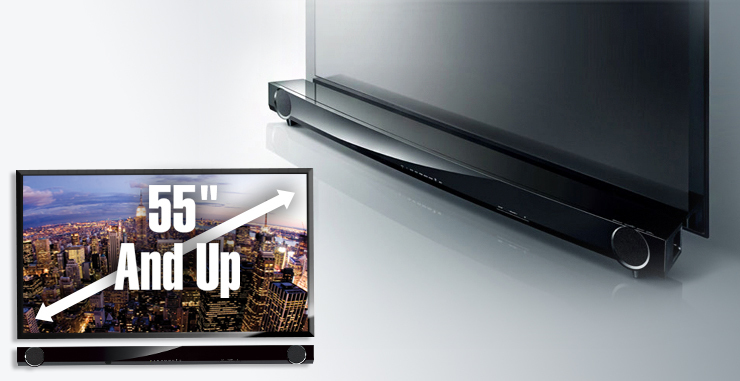 At 47-1/4” wide, the YAS-152 perfectly complements the look of 55” and larger TVs. When placed on a stand, the bar’s feet allow it to straddle the base of a TV or can be removed for a lower-profile look. The bar can also be mounted to a wall using commercially-available hardware and an included mounting template. Its elegantly-curved front surface and glossy-black finish add a stylish accent to your entertainment center. No need for a separate subwoofer unit! The YAS-152 is equipped with two full-range drivers on the front and two down-firing subwoofers integrated discreetly into the bottom of the bar. The drivers are separated to the left and right sides, for sound with breadth and superior imaging suitable for a large screen. The subwoofer drivers, employing large magnets and large-diameter voice coils, work in combination with the large-volume cabinet of the sound bar and bass reflex ports to deliver outstanding bass response. The bass reflex ports have a straight shape and proper length, as well as ducts shaped like trumpet bells, which reduces wind noise for better sound clarity. Fill your home with music the quick and easy way! Stream music from Bluetooth-compatible smartphones, tablets and computers. The YAS-152 can also be set in Bluetooth standby mode, enabling the bar’s power to turn on or off automatically for energy-saving convenience. 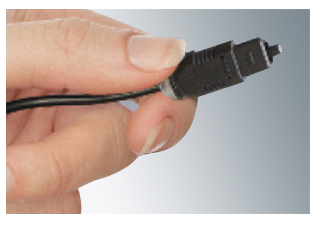 Connect to your large-screen TV with a single digital optical cable - included in the box. The YAS-152 is compatible with a Home Theater Control App (HT Controller), available for free download for Apple® iOS and Android™ devices. 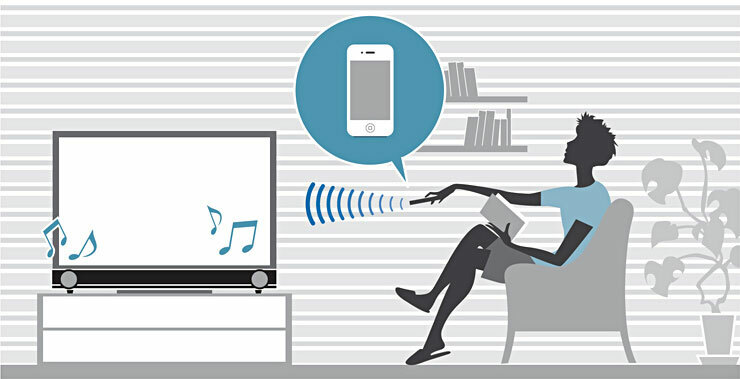 The app makes it easy to control the sound bar via a Bluetooth connection, including input selections, surround modes and other settings. 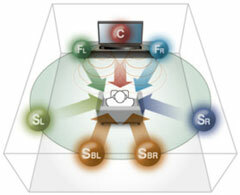 Some sound bars only deliver stereo sound, while others deliver virtual surround sound with inaccurate imaging. The YAS-152 employs AIR SURROUND XTREME, a Yamaha-exclusive virtual surround technology that reproduces 7.1-channel surround sound with excellent imaging and rich presence, far superior to that of any other sound bar. You’ll experience an extremely realistic and impressive sound field, with clear dialogue in the front and dynamic sound action at the back. The YAS-152 is compatible with popular surround sound formats, such as Dolby® Digital and DTS Digital Surround™, so you get the full effect of multichannel movie sound. Clear Voice raises the level of dialogue and narrations while maintaining overall sound quality. Movies and TV shows, sports commentary and news broadcasts are more clearly audible. 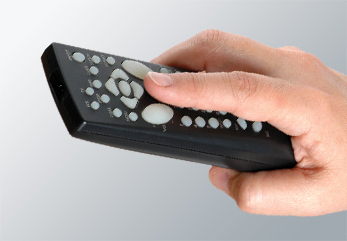 The YAS-152 offers a learning feature that allows you to turn the sound bar on/off and control its volume level using your TV’s remote control - a great way to reduce the number of remote controls on your coffee table! 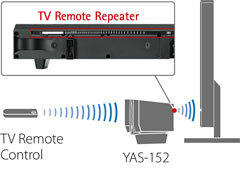 Even if the YAS-152 blocks the TV’s remote control signal, the TV Remote Repeater on the back transmits the signal to the TV so operation is not affected. This welcome feature, made possible by Yamaha-developed technology, maintains a consistent volume level between different channels, programs, commercials and input sources. It can be switched on and off.